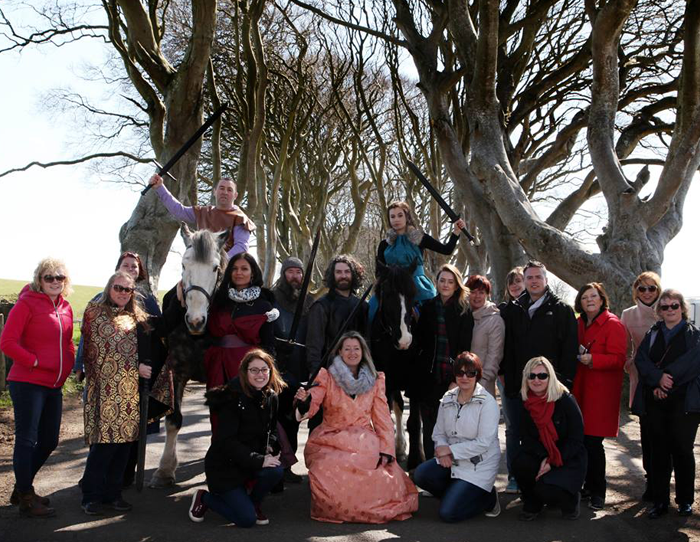 Our coast line is filled with iconic settings from the show and our Game of Thrones horse riding adventure overs a truly authentic and unique way to experience our Game of Thrones territory and take in the stunning Causeway Coast. This 1-day experience is a taster and will give you an opportunity to get dressed up and ride at the Dark Hedges which was used as the Kings Road. Walk, trot and canter through the farmlands and the stunning beach that surrounds Ballintoy while also riding in the footsteps of Arya Stark and Theon Greyjoy at Ballintoy harbour which was used as the filming location for the Isle of Pyke. Finish off your day as you navigate your way along the coastline to Larrybane and the very spot where Brienne beats Ser Loras and is given a place in Renly’s Kingsguard. 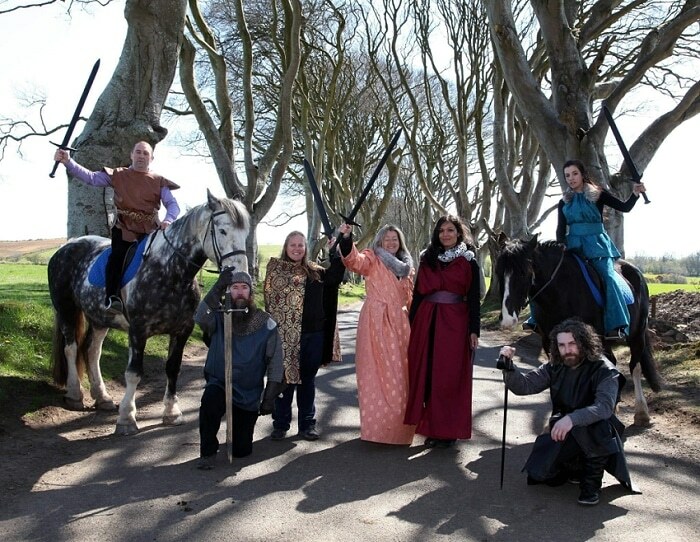 Our coast line is filled with iconic settings from the show and our Game of Thrones horse riding taster adventure offers a truly authentic and unique way to experience our Game of Thrones territory and take in the stunning Causeway Coast. Your day will begin at our centre where you will be welcomed by our team. Before heading to the stables, enjoy tea, coffee and homemade scones while one of our Game of Thrones experts presents an audio-visual presentation showcasing the different filming locations you will be visiting alongside the scenes which were filmed at each place. 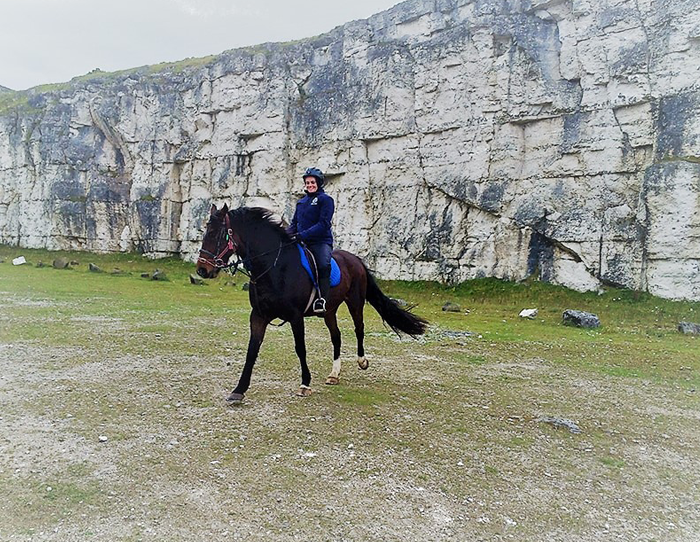 After heading to the stables and selecting a horse, we’ll hit the trail, riding out into the wilderness of the North Antrim Hills and taking in the stunning, panoramic views. Once back at the stables, we will load your horses while you are whisked away to our costumes room to adorn yourself in splendid Game of Thrones themed costumes along with swords and armour. We will then transport you and your horses to our first stop; The Dark hedges, known better by fans as the Kings Road, the place where Arya Stark, dressed as a boy, escaped from King’s Landing in the company of Yoren of the Night’s Watch, Gendry, and Hot Pie. Dressed in themed costumes, we’ll tread a real Westorosi road, on horseback as Lord of the land! After taking in your surroundings and ensuring you have the perfect picture to take back home, you can set the costumes to one side and get ready to enjoy some top-quality riding. We will transport you and your noble stead to Ballintoy. This single stop on our tour lets you view 8 different Game of Thrones’ scenes and 3 different parts of Westeros. You will walk the same footsteps as Arya Stark, Theon Greyjoy, Gendry, Salladhor Sann, Ser Davos Seaworth, Melisandre and the One True King of Westeros, Lord Stannis Baratheon. This stop not only offers fantastic photo opportunities with scenery straight out of the show, but we also have the opportunity to enjoy some top-quality trotting and cantering through open farmland and across Whitepark bay. Whitepark bay is a beautiful stretch of pristine beach located on Co. Antrim’s North Coast near the picturesque village of Ballintoy. We’ll take our time playing on the beach & in the ocean before cantering over the smooth sands! If we’re lucky the famous “Sunbathing Cattle” will be on the beach basking in the sun’s warmth. After stopping for lunch at the Red door café, we will follow in the same footsteps as Arya Stark, Theon Greyjoy, Gendry, Salladhor Sann, Ser Davos Seaworth, Melisandre and the One True King of Westeros and Lord Stannis Baratheon as we meander down the cliff road to the iconic Ballintoy harbour. Ride through this stunning harbour location which was the setting for Theon’s return to the Iron Islands as well as some of the areas around Dragonstone. It was here that Theon first met his sister Yara and was baptised in the name of the drowned god. Our day continues through the quaint coastal village of Ballintoy towards the iconic Larrybane quarry nestled on the side of the limestone cliffs of the Causeway Coast. Larrybane hosted several key scenes, including where Brienne beats Ser Loras in Renly’s tourney (the melee at Bitterbridge) and is given a place in Renly’s Kingsguard as a reward. King Renly Baratheon also swears to Lady Stark that he will avenge Ned’s death, but meets his end at the hands of Melisandre’s shadow baby; some of the other characters featured here include Margaery, Littlefinger and Ser Davos. Take the time to bask in the glory of Brienne as you and your noble horse look out across the Westerios to Rathlin Island and the Western Isles and highlands of Scotland. 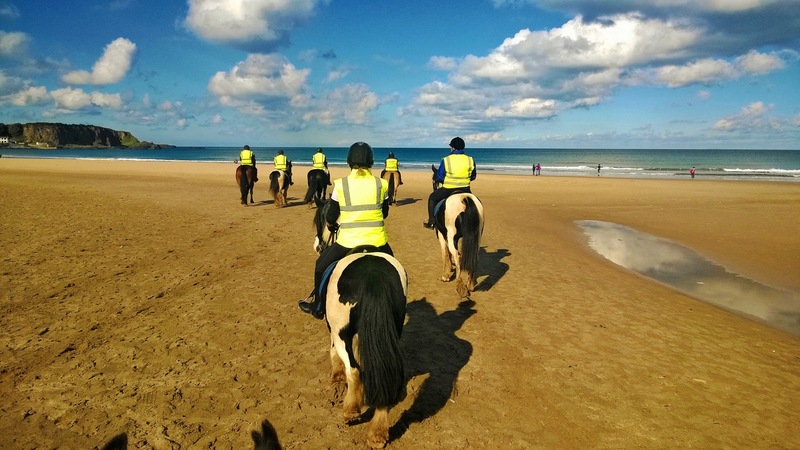 With the stories, the characters and the scenery of the show more firmly etched in your mind, its time to say goodbye to your trusted stead and BEI guides as you move onto the next step of your holiday in Ireland. What’s Included in the trip? This ride is available all year round. Contact us for booking.